Customers reported quality issues in this eBook. This eBook has: Poor Formatting. Witches, warlocks, magic spells and potions! Josh Deegan, a burnt out country and western singer has come to Silver Valley to rediscover his muse. He has inherited an old farmhouse that holds some spooky surprises. He falls instantly in love—or is it lust—with Lizzy Sweet, the local librarian and there are more surprises there! Wesley Gordon, who is in love with Lizzy, is not impressed. The quirky old folk of Silver Valley watch fondly as the battle between love and lust plays out. Leaden and golden arrows zing around, spells are magicked, potions stirred, and ghosts hunted. Who will fall in love and who will let the other go forever? 5.0 out of 5 starsA lot of fun to read! What a lot of fun to read! The author categorises this story as a novella but I thought of it as a long short story. The goddess Venus plays a trick on her son Cupid by betting him he can’t make a certain mortal woman fall in love and forget her inhibitions to pursue the object of her desire. Cupid takes the bet not knowing that the dowdy librarian, Lizzy Sweet, is in fact a 300 year old witch and is going to be much harder to manipulate than he thinks. Even less straightforward is the fact that once the spell is cast there are two men pursuing Lizzy, a mortal and a warlock. How Seaton weaves the story of mortals and immortals, and love and lust together makes for a very entertaining couple of hours’ reading. She does it well. I enjoyed reading the reviews on this book so I purchased it but when I went to read it - all of the pages are blank, I have the cover of the book and the chapters are highlighted as reading Chapter 1 - Chapter 2 - Chapter 3 etc. but no words, the whole book is blank. I have purchased other books at around the same time and there was no problem with them. Therefore, as I have not had the pleasure of reading it I am unable to grant any stars, signed: a very sad customer especially after paying for the book. 4.0 out of 5 starsLoads of fun! Cupid and Venus were up to their usual hijinks with Venus making a wager with her son. Languid and bored, Cupid accepted the challenge – the payment after all was worth it. Lizzy Sweet was the target – sweet by name; sweet by nature – a librarian in the tiny town called Silver Valley where she’d lived for a long time. Venus neglected to tell Cupid that Lizzy was a three hundred year old witch who couldn’t fall in love with a mortal or it would be her downfall. And Lizzy’s best friend Wesley Gordon was a warlock who’d loved Lizzy for a long time – he most definitely wasn’t happy to learn of recent events. What would happen to Lizzy when she saw Josh Deegan immediately Cupid’s arrow had struck? Were there spells to stop what would be deadly for her future? Silver Valley Witch by Aussie author Annie Seaton is a short paranormal novella which was loads of fun; a quick, light read, and easy to recommend. Witches, warlocks, magic spells, potions – you name it, it’s all there! Excellent! 4.0 out of 5 starsA fun, charming read. Take Cupid, his mother Venus, Wesley the Warlock, and Lizzy Sweet the Witch of Silver Valley plus a variety of supporting characters, including a ghost, all orchestrated by author Annie Seaton, and what do you get? A rocking good fun story which offers up more surprises than you should expect from a novella. But Ms. Seaton manages it. This fluently written short story finds plenty of space to create vivid scenery and settings, fully-formed characters with their own dreams and fears. The author deals out lessons, like confetti, to her main characters and had this reader wondering how she was going to untangle the mess her characters were making of their lives. And of course she did, and managed to wrap each of them in their own form of HEA – happy ever after. I read this in one sitting and ‘turned the last page’ with a happy sigh of satisfaction. For those of you who enjoy reading paranormal then this book is worth adding to your collection. 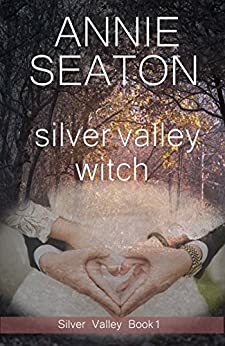 If you enjoy reading an author who litters her stories with gentle ‘tongue-in-cheek’ fun then take a look at Silver valley Witch. If you enjoy a very written story, packed full of emotion, complications, and a sense of community unity then Ms. Seaton is offering just that in this story. 4.0 out of 5 starsNever underestimate Cupid!!! Venus and her son, Cupid, made a wager that Cupid couldn't get a specific woman to fall in love. Completely in love! Lizzy Sweet is that woman and she's a witch with a family curse she never wants to activate. You might think you know what's going to happen but you don't. I love a book that surprises me with good plot twists. This is a very good short story with witches, warlocks, and ghosts. Well written lighthearted romance. Annie Seaton never disappoints!